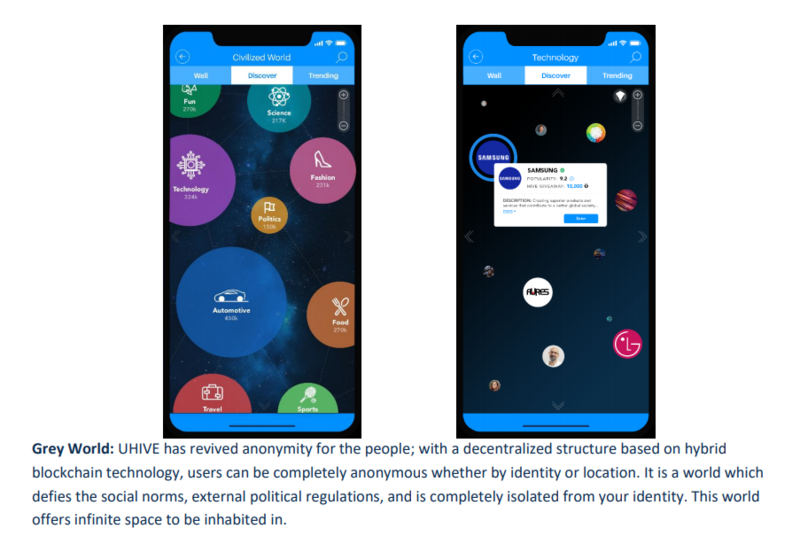 With an increased active population and a gain in traction on Mobile social networks (forecasted to surpass 6.2 billion users within a year), and with the integration of advanced mobile processors across devices, a growing potential has contributed to UHIVE’s development of advanced social network platforms. UHIVE is challenging the status quo, transforming social networking and taking it into a new era, that combines the technological capabilities (artificial intelligence and blockchain) with human psychology to deliver a unique, natural, and entertaining experience. Our commitment is to enhance individuals’ interaction within dyads, groups, and societies through integrating foundational knowledge from social and developmental psychology and sociology, with our advanced blockchain technology, which has paved the way for the creation of the world’s first social platform with physical dimensions. We are pushing a new edge of social networking, which will provide more than the common interactions of sharing media or comments on pages, it will provide a new way for users to explore and perceive information through their senses. Unlike other social networks, which limit users to searching for keywords, relevant words and hashtags in order to start up a new discovery journey for random topics; UHIVE will grant customers the opportunity to walk through infinite spaces and identify trendy communities worth exploring. UHIVE’s realistic experience helps users perceive information with their sight sensors. Physical dimensions will help users perceive information like community sizes, populations and user engagement by visual representations such as size, depth perception, scaling, and visual effects. UHIVE SOCIAL NETWORK HAS TWO INNOVATIVE EXPERIENCES EMBEDDED, CIVILIZED WORLD AND GREY WORLD. Civilized World: Like Earth, it is a civilized network governed by rules and imposed regulations. Identities are real, people can connect with their families and friends, and meet other people. It is a network which is exposed and influenced by external factors such as politics, social norms, and global regulations. UHIVE will introduce its own digital currency (UHIVE Token), that is similar to gold in real life. The UHIVE Token is divisible, portable, recognizable and, most importantly, scarce in terms of a limited supply, and abundant relative to its consumption and circulation. UHIVE Tokens will be the trading currency for products and services within both worlds. Our A.I. (artificial intelligence) technology has enabled us to further evaluate worlds by spaces, traffic, engagement, and by the audience’s affinity. Spaces (physical location) will have a value, and people can exchange spaces or sell them using our cryptocurrency, like property in real life. Our algorithms provide spaces with intrinsic values, taking into account tangible and intangible factors. Users will want to invest in space location and try to increase its value. Consider real life examples, where the price of land varies according to its location, accessibility to economic activities, neighborhood amenities and demand & supply functions. In a sense, a new world of digital economy is about to be born. As your space grows in audience size, the surrounding spaces become a desirable focal area; users will able to organically spot your space from far away. Given the human nature and psychology when attracted to certain sceneries, like when driving through a metropolitan city and your eye spots a very long queue at a store front, or a high-rising building standing out from surrounding buildings, your eyesight triggers and ignites your mind’s curiosity. The embedded algorithms will give intrinsic value to adjacent spaces as they will be relatively affected. Individuals and businesses will offer you money for it. Users can contribute to the economy of UHIVE by engaging with other users, and by posting and sharing media. Spending more time in the network will be rewarded with UHIVE Tokens, which eventually can be exchanged for global currencies (USD, GBP, Euro, JPY, etc…) on the digital currency exchange platforms. This network is selfsustained, with its independent advertising revenue stream, which is relatively proportional to the number of active users. The value of UHIVE Crypto Tokens will be sustained at the start and is bound to grow with time. Human needs are unlimited, the UHIVE social network will allow people to do numerous things: earn money, establish a new digital life, explore things you never knew existed, have fun, socialize, meet new people, and much more. The platform design is very innovative, and it is designed from the ground up to be mobile-based and VR ready. Our future development plans involve connecting UHIVE to brain sensors and IoT (Internet of things) devices, for users to interact in real time and further develop an exciting experience. Started working on the Idea. Researching social networking and human Psychology. Working on the Financial Ecosystem. Working on the Grey world concept and behaviour. Working on integrating Hybrid Blockchain in the Grey world. Adding Cryptocurrency ecosystem. Expanding the Team and working on preparing a beta release for iOS and Android Apps. Releasing Beta version to the world. Release UHIVE Tokens into Cryptocurrency Exchange markets. Release the App in 8 Different languages. Release new updates and features. Start working on our ADs (Advertisments) Platform. Enter China with Partnerships with China biggest Cloud Providers and ISPs (A New World for China). Release new Updates and Features. Release the App for another 10 Languages. Release our Advertisement Platform Version 1.0. Release XBOX and PS4 editions, where people can explore the social network. Platform Updates. Connect it with Smart TVs and many new IoT Devices. Platform Updates.